We headed into Cone Hut from the Waiohine roadend on Friday night (after getting Chinese takeaways in Greytown – recommended! ), and got to Cone at 9.45 that night. Cone is a great little hut and is renowned in arachnologist circles for having some of the hugest spiders in the Tararuas. We crashed almost as soon as we got there as we had an early start the next day. We left Cone Hut at 6.45 Saturday morning after we had our various (some of them unusual) breakfasts and headed into the humid morning. Straight away it was uphill to Cone saddle and we were sweating like crazy – and fairly concerned for the limited water supplies that we were carrying. Reaching Cone Peak at 9.00am, we broke above the bush and saw a DOC sign advising that it would take us between 6-9 hours to get to Mount Hector. We didn’t quite believe it at the time, although in the end, this section did take us 6.5 hours. Soon after we reached Neill Peak at 11.00am. 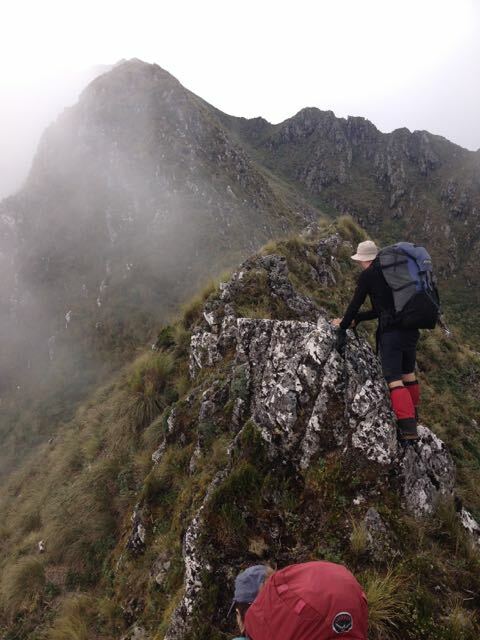 This route is a bit of a fairly consistent uphill grind, which (by the time we reached Hector) saw us doing about 1200m overall height gain. 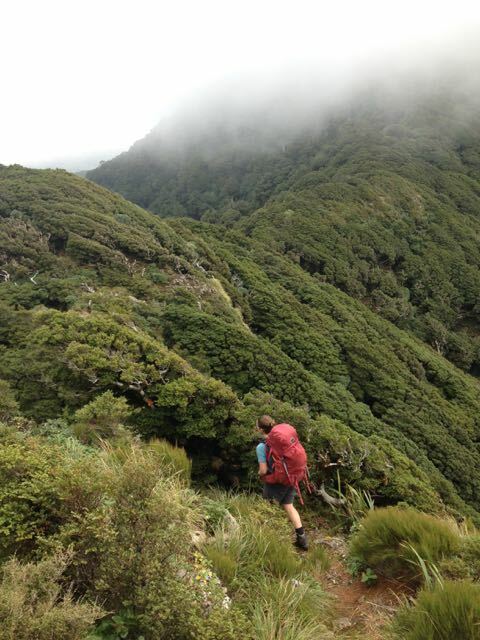 Plus, parts of the track between Neill Saddle and Winchcombe in the bush were easy to lose (having comparatively less traffic that other routes) and we did have a few places to climb over tree-fall. We had a lunch stop in the bushline below Winchcombe peak at around a quarter to one. We got to Winchcombe peak at 1.30 and later had a stop on the ridge in the gloom and scudding low cloud, eyeing up the next pinnacle that we had to go up and over. Apart from the inexorable and very steady uphill, we found the ridge between Winchcombe and Hector straightforward, and kept plodding up, to reach Hector at 3:45. Once there, we admired the much higher standard of track and easier travelling! All was well until the Beehives…..it was great to get to Atkinson and look down false Spur straight to Alpha in the far, far distance. From Aston it was straightforward walking until we had out last uphill grind – another 100-or-so metres up Alpha peak. We got to Alpha at 6.35 that night after some refreshing downhill, and cranked up our tuna and rice curry. Almost unbelievably, we were alone at Alpha that night. Saturday night wasn’t as warm as Friday was, so I think we slept better. Plus we had a virtual sleep-in on the Sunday, getting up to head back to Cone Hut a bit later and leaving Alpha at 8. We passed Hells Gate and then passed through the lovely open plains at Bull Mound, before dropping down to the Tauherenikau River at 10.45. Fons and Emily had a swim, while Simon just dipped his feet in. 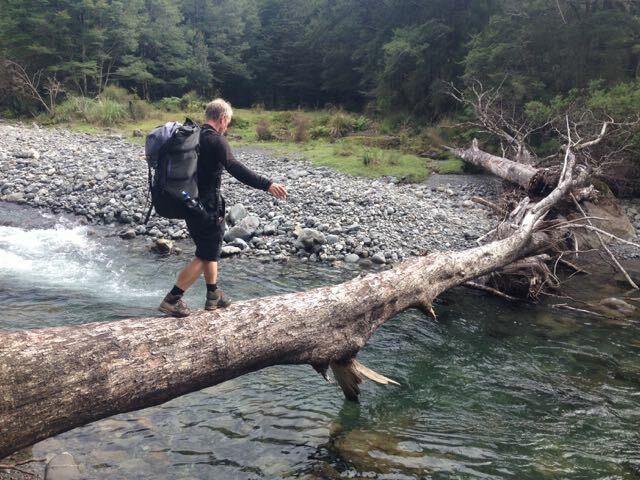 There was also a conveniently-dropped tree across the river which ensured that we kept our feet dry! Cone Hut was just down the track a few minutes so we stopped there at the picnic table for lunch, to reach the road end again at 1.30. We didn’t see many people the entire trip, so to see throngs of day-trippers at the Waiohine road-end bridge (plus swimmers in the river far below) was a bit of a shock, on what had now turned into a very hot day. This was an excellent trip and full points to Emily for taking us on a route less travelled! I’m from AUS and looking at doing an overnighter through here over new years. Thinking up and down to Alpha hut and try make a circuit out of it. 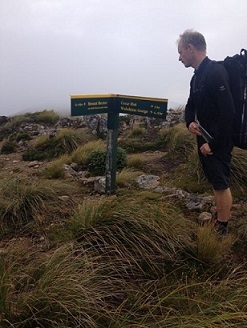 You guys went across to Mt Hector which seemed like quite the slog! 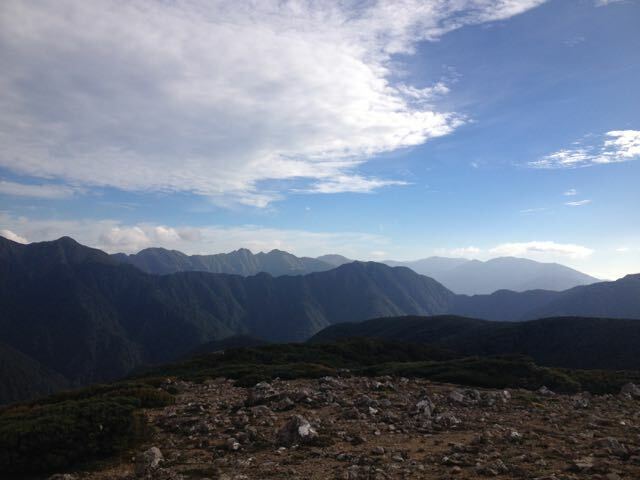 Not all member in our group are of high fitness, however I think we’d be able to handle 5 hours hard hiking per day. Do you think we’d get up Alpha in that sort of a time frame? 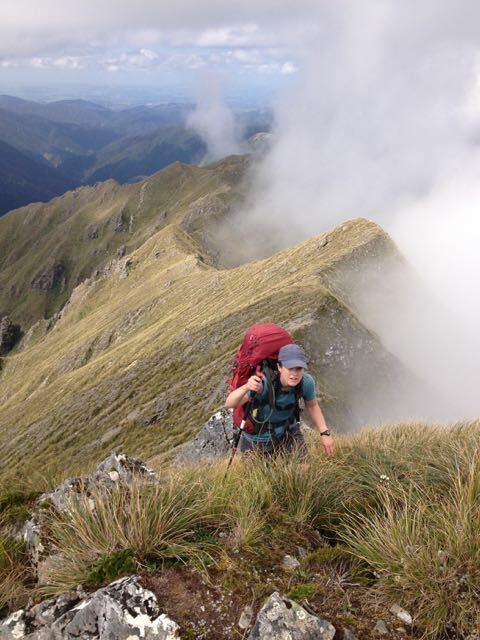 Or would you recommend trying somewhere else; such as Kaituna up to Tarne Ridge Hut, then back down via Gentle Annie Saddle? Would love to hear your thoughts or recommendations.